You can view your subscription information if you have access to the Admin Panel of Zoho CRM Plus. Click the Subscription icon ( ) to the left of the page in the Admin Panel. 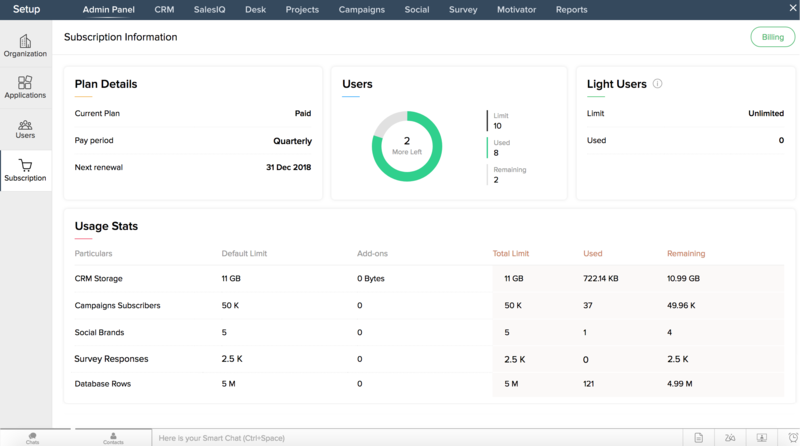 The Subscription Information page will be displayed, showing the current plan and usage statistics of your user licenses, light users, and application's core resources. These details depend on your current plan. Plan Details: Displays your current plan which is either Trial or Paid. If you have the trial version, the expiration date of your trial and number of days remaining in your trial period will also be displayed in this section. If you are a paid user, you'll find the pay period and the next renewal date in this section. The pay period is based on your payment type. For example, if you have made your payment online, the pay period displayed will be either Monthly or Yearly. If you have made your payment offline, your pay period will be Monthly, Quarterly, Half-Yearly, or Yearly. Users: Displays the current usage statistics for the user licenses. You can view details including the total number of user licenses allowed, licenses utilized, and the number of licenses remaining in your plan. Light Users: Displays the usage statistics for light users in the plan. The total number of light users you have utilized so far will be displayed in this section. 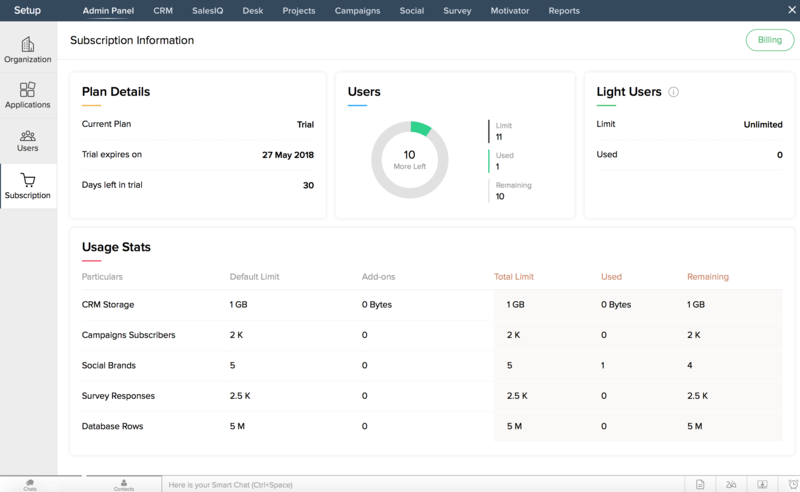 Usage Stats: Displays the usage statistics of the application's core resources such as CRM Storage Add on, Social Brands Add-on, etc. You will find details including the resource's name, default limit available for each resource, and the number of resources purchased in Zoho CRM Plus. This section also displays the total limit available for each resource, number currently used, and the total resource remaining in your plan. Access the Admin Panel. The Users tab is selected by default with the Users page displayed in the Admin Panel. Click the Subscription tab ( ). The Subscription Information page reflects your current plan. If you are using the trial version of Zoho CRM Plus, click Billing from the Subscription Information page to subscribe to the CRM Plus plan. If you are a paid user, click Billing from the Subscription Information page to manage your subscription details.